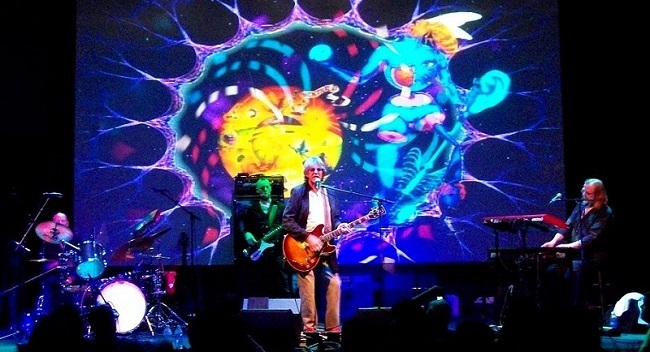 Legendary british prog rock band Nektar are to release a brand new studio album on June 18. Produced by Billy Sherwood, the new album is called Time Machine, and will be released on the Purple Pyramid label, and is their first studio album with all new material since 2008’s Book Of Days; last year they did put out A Spoonful Of Time, but this was a covers album. Time Machine is the 13th studio release in all, and mainman Roye Albrighton reckons this to be, ”The best album Nektar have ever made”. The band have posted a sneak peak from it on their Facebook page. You can listen to it here. And you may now pre-order a copy of the album at Amazon. Nektar, who also currently feature drummer Ron Howden, keyboardist Klaus Hentasch and bassist Lux Vibratus, start a special 12-date American tour on June 20. What makes this special is that the band will be playing the whole of their classic fourth album //Remember The Future//. This is in celebration of its 40th anniversary.